Any Agents of SHIELD fan missing their fix this winter hiatus should be sure to check out Slingshot, the six-part webseries detailing Elena “Yo-yo” Rodriguez’s whereabouts between seasons 3 and 4 of the show. Natalia Cordova-Buckley has had a few chances to shine over the course of the series, but never as brightly as she does here. 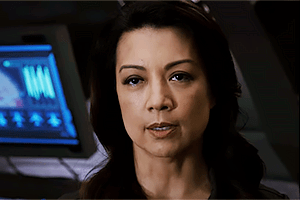 The series could be considered a special episode of SHIELD with the way that it unveils not only new aspects of her character, but uncovers hidden sides to many other regular cast members as well. 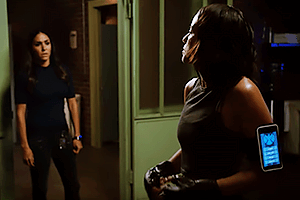 The first segment begins as Yo-yo checks in with teammate Daisy Johnson (Chloe Bennet) to make sure they have their stories straight for SHIELD’s Director, Jeffrey Mace. The start of this story flows seamlessly from the midseason finale, since Daisy has just been reinstated. And the camaraderie between the two ladies is a good reminder of the off-screen adventures we heard about earlier this season. With the framing device in place, the series steps back a few months to before season 4’s premiere. This gives viewers a chance to glimpse the first days of SHIELD’s public re-branding. Even better, we’re treated to a lovely conversation between Yo-yo and Phil Coulson (Clark Gregg) that highlights the mutual respect and affection between them. Watching a no-nonsense women like Elena treat Coulson with so much warmth further proves what a good leader he is, even to agents outside of his immediate sphere. With such a large cast, moments like these are few and far-between for recurring characters like Elena. Slingshot is already worth it just to see these great actors play off each other in ways they normally don’t get to, and easter eggs like Peggy Carter’s ring make it all the more fun, but the plot is compelling too. 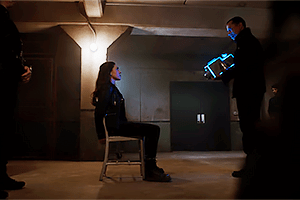 By the latest episode of Agents of SHIELD, Jeffrey Mace (Jason O’Mara) has already established himself as Director and secret Inhuman, but Slingshot provides a look at his early days on the job and just how eager he is to impress while still imposing his orderly view on others. From the moment he steps into his office and tries to engage with Elena in broken Spanish, it’s clear what kind of man he is. His invasive look into Elena’s life also jump starts the story line for the webseries: the Colombian arms dealer who killed Elena’s cousin Francisco has escaped and made his way to the US, and Yo-yo is ready to track him down. Unfortunately, bureaucracy is the name of Mace’s game, leaving Elena no choice but to resort to underhanded methods to see Victor Ramon (Yancey Arias) brought to justice. 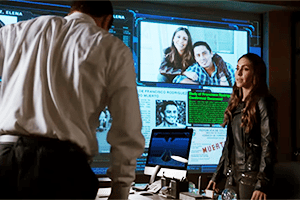 It’s a tall order to pull off Elena working her way through SHIELD’s security system and deceiving characters like Fitz and Simmons while still reaching out to them as a friend, but it’s something that Natalia Cordova-Buckley pulls off with aplomb. Though her focus remains largely on the vengeance she is plotting, the care and respect she has for her fellow agents is plain to see. 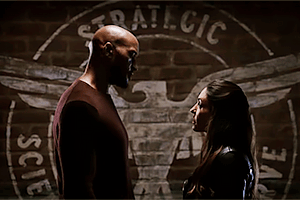 There’s even a wonderful moment between her and Mack (Henry Simmons) that showcases their chemistry and provides a backdrop for their flirtations throughout season 4. Furthermore, Slingshot delves deeper into the struggle between losing one’s freedom and gaining a sense of belonging. Not only do the flashbacks establish how Daisy’s disappearance affected the team, but they also spotlight Elena’s completely understandable sense of frustration. Her actions in the show take on new layers of meaning with the added material in these episodes. One of the best things about Slingshot is that every major character gets their moment to shine, but they never outshine Elena. We learn something new about the main cast – or otherwise get to enjoy some of their more established traits – but it’s always in relation to Yo-yo and her predicament. May’s quick observational skills are on full display, but her decision to help further Elena’s mission says as much about Yo-yo as it does May herself. The fourth part of the miniseries is what kicks off the confrontation with Victor Ramon, making excellent use of the material originally provided in their season 3 introductions. One small but important side note: it’s so refreshing to see a Latina character like Elena given realistic dialogue in Spanish, and doubly refreshing to have that dialogue spoken by an actress who clearly knows Spanish. Whether her lines were written in or the product of improvisation, they added immensely to the proceedings. Every segment of Slingshot was well-directed, packing as much as possible into five minutes without feeling overstuffed, but John P. Gordon gets a shout out for his deft handling of the most action-oriented section. The low lighting added to the tension without suffering from the usual plight of total blindness, and the final moments felt earned despite the short length of the fight scene. Not only does the webseries flesh out the enmity between Elena and Victor, helping uncover some of what drives her, but it further explains the friendship between Elena and Daisy. It’s rewarding to learn the origin between Yo-yo’s fierce loyalty to Quake, and it turns out that the friendship that blossomed between them in early season 4 was more than warranted. The subtitle for the story’s conclusion would also have worked as the name of the entire webseries, because in the end Elena’s tale boils down to the meaning of justice. Interestingly enough, the pat denouement that most viewers would expect is not actually what happens. Lessons may have been learned, but they’re for Elena to process and decide the truth of on her own. One such lesson, for example, is the importance of teamwork. But not necessarily Mace’s bureaucracy-laden trust and triumph method. Sometimes simply knowing that a friend like Daisy will have your back and will trust you to know what’s right is all you need. Overall, Slingshot turned out to be a pleasant surprise during the network-mandated break from Agents of SHIELD. Well-acted and written, and full of poignant character moments, it could easily have been its own full-length episode. Hopefully Marvel will roll out more extras like this in the future! Remember to watch on ABC, Hulu or YouTube.